Congrats to all the Club Champs participants and coaches on a job well done. And a special thanks to our Director of Age Group Kelsey Holshouser and her folks for having all 3 the teams over for a club BBQ at their home. After a busy spring the CalCup season is over. All three teams went 2-3 and competed well. 16s & 18s had competitive brackets and were a goal from advancing to top 8. Game Notes: 16s had a shootout loss to SD Shores, while the 18s beat SD by 1. Both had a one goal loss to Xtreme (16s), and SB (18s). 14s played tough and had 2 wins going into the final game, losing in a shootout. Time to carry momentum into the summer! JOs ended on a high note for the club as the 18s won the bronze medal, 6-2 over Socal. Check below for all of our teams’ results. Click here for summer 2007 team photos. After winning the 20-under Nationals, Coach Susan led the open team to fourth place at the USA Water Polo National Championships. The team fell to eventual champion NYAC in the semifinals and lost a close game to Santa Barbara in the bronze medal game. Team roster: Megan Burmeister, Remy Champion, Kelly Eaton, Jackie Gauthier, Molly Hayes, Kira Hillman, Alex Koran, Pallavi Menon, Lizzie Rouleau, Camy Sullivan, Heather West, Tanya Wilcox, Cassie Wyckoff. 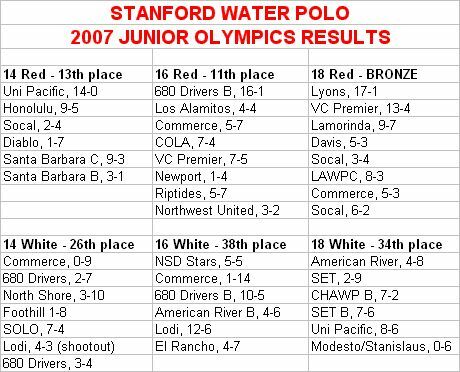 Stanford defeated SET 10-8 to win the gold medal at the USA Water Polo 20-Under National Championships. Coach Susan and her team successfully defended their 2006 20-Under title. Stanford beat Houston and CHAWP before tying Commerce. In the second round, the team beat Santa Barbara and SET, both by one goal. Stanford handled Socal in the semifinals and then wrapped up the tournament with the gold medal win over SET. 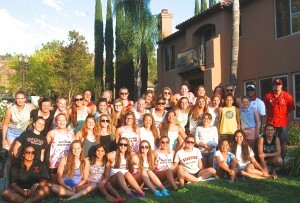 Read the article from the Palo Alto Weekly. Stanford club members Phoebe Champion and Kim Krueger helped the USA 20-under national team finish fourth at the 7th FINA Junior World Championships in Portugal. In the first round, the team beat Portugal, lost to Hungary and beat Germany. Team USA defeated Japan in the round of 12 and Italy in the quarterfinals before falling to China in the semifinals. Hungary defeated Team USA in overtime for the bronze medal. Stanford’s Kyle Utsumi was the head coach of the team.